Astronomy is a subfield of physics. Since physics also concerns itself with the quantum realm, the purview of physics extends over 61 orders of magnitude from the diameter of the universe (8.8 x 1026 m) to the Planck length (1.616 x10-35 m). That's a lotta yotta! The first Nobel Prize in Physics was awarded in 1901 to Wilhelm Röntgen (1845-1923) "in recognition of the extraordinary services he has rendered by the discovery of the remarkable rays subsequently named after him." Röntgen rays sound like something from a Flash Gordon serial. We now call such rays x-rays. The Nobel Physics Prize wasn't awarded in astronomy until 35 years later, and the second wasn't awarded until 31 years after the first. As can be seen from the table, below, astronomy Nobel Prizes became much more frequent after 1970. This was a consequence of improved instrumentation, with radio astronomy born from World War II radar technology and satellite observatories enabled by the "space race." 1936 Victor Hess "for his discovery of cosmic radiation." 1967 Hans Bethe "for his contributions to the theory of nuclear reactions, especially his discoveries concerning the energy production in stars." 1974 Sir Martin Ryle and Antony Hewish "for their pioneering research in radio astrophysics: Ryle for his observations and inventions, in particular of the aperture synthesis technique, and Hewish for his decisive role in the discovery of pulsars." 1978 Arno A. Penzias and Robert W. Wilson "for their discovery of cosmic microwave background radiation." 1983 Subramanyan Chandrasekhar "for his theoretical studies of the physical processes of importance to the structure and evolution of the stars," and William A. Fowler "for his theoretical and experimental studies of the nuclear reactions of importance in the formation of the chemical elements in the universe." 1993 Russell A. Hulse and Joseph H. Taylor Jr. "for the discovery of a new type of pulsar, a discovery that has opened up new possibilities for the study of gravitation." 2002 Raymond Davis Jr. and Masatoshi Koshiba "for pioneering contributions to astrophysics, in particular for the detection of cosmic neutrinos," and Riccardo Giacconi "for pioneering contributions to astrophysics, which have led to the discovery of cosmic X-ray sources." 2006 John C. Mather and George F. Smoot "for their discovery of the blackbody form and anisotropy of the cosmic microwave background radiation." 2011 Saul Perlmutter, Brian P. Schmidt and Adam G. Riess "for the discovery of the accelerating expansion of the Universe through observations of distant supernovae." It's obvious that early 20th century astronomers were unlikely to be awarded a Nobel Prize, although their discoveries may have been on par with Gustaf Dalén's invention of the sun valve, a solar-activated flow control valve for which he was awarded the 1912 Nobel Prize in Physics. One such neglected astronomer was the Swiss-American astronomer, Fritz Zwicky (1898-1974), whose tenure at the California Institute of Technology was marked by many contributions to theoretical and observational astronomy. Zwicky proposed the existence of dark matter, and he discussed the mass distribution of galaxies and the possibility of gravitational lensing in a 1937 paper. Gravitational lensing wasn't proven until 1979 in observations of the Twin Quasar, Q0957+561. Astronomer, Fritz Zwicky, examining a photographic plate. Zwicky characterized himself as a "lone wolf" who preferred to do most work himself. The asteroid, 1803 Zwicky, and the lunar crater, Zwicky, are both named in his honor. Zwicky had interests beyond astronomy, researching jet engine designs for the Aerojet Engineering Corporation from 1943 through 1961. He was listed as an inventor on more than fifty patents, many of which involve jet propulsion, but his main career interest was supernovae. In fact, he and Walter Baade (1893-1960) coined the term "supernova" in 1934. They hypothesized that supernovae happened when normal stars transformed into neutron stars, producing cosmic rays. Zwicky discovered more than a hundred supernovae himself in the era in which this task was accomplished by laborious examination of photographic plates, as in the above photo. A view of neighbor galaxy, Andromeda, by the Zwicky Transient Facility (ZTF). This image , just a sixteenth (2.9 square degrees) of ZTF's full field of view, is a composite image of three visible light ranges. 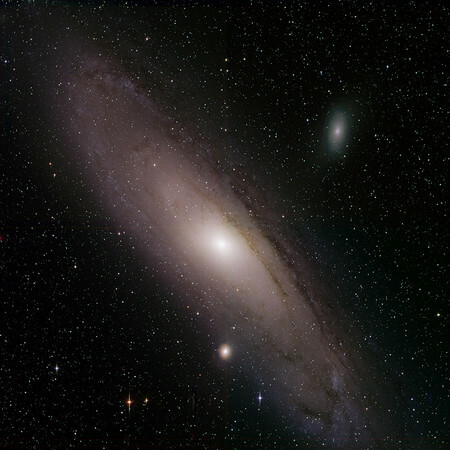 Andromeda is 2.5 million light-years distant. ZTF observations are through the 48-inch Samuel Oschin Telescope at Palomar, where it surveys the northern skies for transient events; that is, explosions, movement, or changes in object brightness. It has a wide single-image observation field that's 240 times the size of the full moon. It surveys the entire northern sky every three nights, and it discovers several supernovae each night. There's an automated messaging system that automatically sends alerts to astronomers within 10-20 minutes when events are detected, and a program funded by the National Science Foundation called GROWTH that sends alerts to 18 international observatories in the northern hemisphere. There can be hundreds or thousands of alerts per night. "There's a lot of activity happening in our night skies... In fact, every second, somewhere in the universe, there's a supernova that's exploding. Of course, we can't see them all, but with ZTF we will see up to tens of thousands of explosive transients every year over the three-year lifetime of the project... It's a cornucopia of results... We are up and running and delivering data to the astronomical community. Astronomers are energized." The Nobel Prize - All Nobel Prizes in Physics, Nobel Prize Web Site. Taylor is also an avid radio amateur, having obtained his first amateur radio license as a teenager. This interest in radio inspired him to enter the field of radio astronomy. Taylor has a special interest in weak signal communication, and he organized an April, 2010, project that used the Arecibo Radio Telescope to bounce radio signals from the Moon to communicate with radio amateurs worldwide. He has a home page at the Princeton University Physics Website, the WSJT Home Page. F. Zwicky, "On the Masses of Nebulae and of Clusters of Nebulae," Astrophysical Journal, vol. 86, no. 3 (October, 1937), pp. 217-246, DOI:10.1086/143864. A PDF copy is available here. Zwicky Transient Facility Opens Its Eyes to the Volatile Cosmos, Caltech YouTube Video, November 14, 2017. 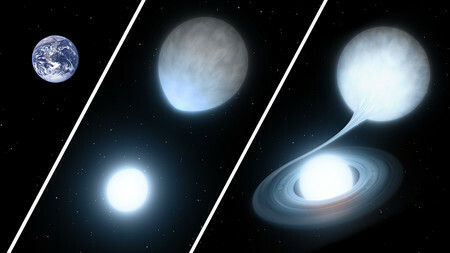 Whitney Clavin, "Zwicky Transient Facility Nabs Supernovae, Stars, and More," Caltech Press Release, February 7, 2019. Eric C. Bellm, et al., "The Zwicky Transient Facility: System Overview, Performance, and First Results," arXiv, February 5, 2019. Matthew J. Graham, et al., "The Zwicky Transient Facility: Science Objectives," arXiv, February 5, 2019. Frank J. Masci, et al. "The Zwicky Transient Facility: Data Processing, Products, and Archive," arXiv, February 5, 2019. Ashish Mahabal, et al. "Machine Learning for the ZTF," arXiv, February 5, 2019. Maria T. Patterson, et al., "The Zwicky Transient Facility Alert Distribution System," arXiv, February 6, 2019. M. M. Kasliwal, et al., "The GROWTH Marshal: A Dynamic Science Portal for Time-domain Astronomy," arXiv, February 5, 2019. Yutaro Tachibana and A. A. Miller, "A Morphological Classification Model to Identify Unresolved PanSTARRS Sources: Application in the ZTF Real-Time Pipeline," arXiv, February 5, 2019. Linked Keywords: Astronomy; physics; quantum realm; orders of magnitude; diameter of the universe; Planck length; yotta; Nobel Prize in Physics; Wilhelm Röntgen (1845-1923); Flash Gordon serial; x-ray; scientific instrument; radio astronomy; World War II; radar technology; space telescope; satellite observatory; space race; Victor Hess; cosmic ray; cosmic radiation; Hans Bethe; nuclear reaction; energy; star; Sir Martin Ryle; Antony Hewish; radio astrophysics; invention; aperture synthesis; pulsar; Arno A. Penzias; Robert W. Wilson; cosmic microwave background radiation; Subramanyan Chandrasekhar; structure and evolution of the stars; William A. Fowler; theory; theoretical; experiment; experimental; nucleosynthesis; formation of the chemical elements; universe; Russell A. Hulse; Joseph H. Taylor Jr.; binary pulsar; gravitation; Raymond Davis Jr.; Masatoshi Koshiba; astrophysics; cosmic neutrino background; Riccardo Giacconi; X-ray astronomy; cosmic X-ray sources; John C. Mather; George F. Smoot; anisotropy; Saul Perlmutter; Brian P. Schmidt; Adam G. Riess; accelerating expansion of the universe; supernova; 20th century; Gustaf Dalén's; sun valve; solar; flow control valve; Switzerland; Swiss; United States; American; Fritz Zwicky (1898-1974); California Institute of Technology; dark matter; mass distribution; galaxy; galaxies; gravitational lens; gravitational lensing; Twin Quasar, Q0957+561; astronomer; photographic plate; lone wolf (trait); asteroid; 1803 Zwicky; lunar crater, Zwicky; YouTube Video; jet engine; design; Aerojet Engineering Corporation; patent; jet propulsion; Walter Baade (1893-1960); conjecture; hypothesize; neutron star; theory; tired light; universal expansion; Hubble's law; cosmological redshift; photon; energy; elementary particle; defocus aberration; blur; professor; Mount Wilson Observatory; Palomar Observatory; Gold Medal of the Royal Astronomical Society; physical cosmology; Zwicky Transient Facility; near-Earth object; near-Earth asteroid; Milky Way galaxy; 2019 AQ3; Andromeda; square degree; field of view; photomontage; composite image; visible light; light-year; D. Goldstein; R. Hurt; Samuel Oschin Telescope; northern celestial hemisphere; northern sky; stellar explosion; apparent magnitude; object brightness; full moon; automation; automated; inter-process communication; messaging system; National Science Foundation; GROWTH; northern hemisphere; Shrinivas Kulkarni; principal investigator; Astronomy and Planetary Sciences at Caltech; cornucopia; mile; Thomas Prince; physics at Caltech; gravitational wave; white dwarf; binary system; mass; orbit; artist's impression; Earth; reference; density; dense; tidal force; tidal bulge; accretion (astrophysics); accrete; Large Synoptic Survey Telescope; international partners; Heising-Simons Foundation; plethora; arXiv.